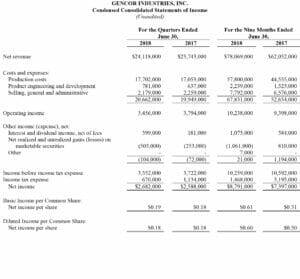 August 2, 2018 (PRIME NEWSWIRE) – Gencor Industries, Inc. (Nasdaq: GENC) announced today net revenues increased slightly to $24.1 million for the quarter ended June 30, 2018 compared to $23.7 million for the quarter ended June 30, 2017. Gross margins were 26.6% for the quarter ended June 30, 2018 compared to 28.2% for the quarter ended June 30, 2017 as material costs have increased. Product engineering and development expenses increased $144,000 to $781,000 for the quarter ended June 30, 2018 due to increased staffing to meet the higher demand for our products. Selling, general and administrative (“SG&A”) expenses decreased $80,000 to $2,179,000 for the quarter ended June 30, 2018. Operating income for the quarter ended June 30, 2018 was $3.5 million compared to $3.8 million for the quarter ended June 30, 2017. For the quarters ended June 30, 2018 and 2017, the Company had non-operating expense of $0.1 million. The effective income tax rate for the quarter ended June 30, 2018 was 20.0% versus 30.5% for the quarter ended June 30, 2017 reflecting the lower corporate tax rates to comply with the recently enacted U.S. tax law, Tax Cuts and Jobs Act (“TCJA”). 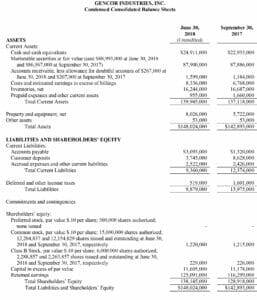 Net income for the quarter ended June 30, 2018 was $2.7 million, or $0.18 per diluted share, compared to net income of $2.6 million, or $0.18 per diluted share for the quarter ended June 30, 2017. For the nine months ended June 30, 2018 the Company had net revenue of $78.1 million and net income of $8.8 million ($0.60 per diluted share) versus net revenue of $62.1 million and net income of $7.4 million ($0.50 per diluted share) for the nine months ended June 30, 2017. At June 30, 2018, the Company had $112.8 million of cash and marketable securities compared to $110.8 million at September 30, 2017. Net working capital was $130.6 million at June 30, 2018. The Company had no short-term or long-term debt outstanding at June 30, 2018. The Company’s backlog was $29.3 million at June 30, 2018 compared to $37.9 million at June 30, 2017. John Elliott, Gencor’s CEO, commented, “Gencor has experienced significant growth over the past two and a half years with revenues increasing over 100% and operating income increasing exponentially over the same period. In the third quarter, revenues were up modestly from the prior year as deliveries on some equipment shifted to the fourth quarter. Backlog of approximately thirty million entering the fourth quarter of 2018 decreased, as the prior year benefited from sales after the highly successful March 2017 ConExpo show and the effects of the transportation bill (FAST Act). As we noted in the 2017 third quarter earnings release, the significant number of sales during the summer months of 2017 were atypical of historic buying patterns from our customers due to pent up demand.